Companies in Rockford and across Northern Illinois can now apply to become a Foreign Trade Zone (FTZ) or subzone through FTZ Rockford and the Greater Rockford Airport Authority. FTZ locations are specially designated areas considered to be outside of U.S. Customs territory. They help to reduce the cost of manufacturing, making domestic manufacturing more cost competitive than overseas production. In 1991, the National FTZ Board approved the Greater Rockford Airport Authority’s (GRAA) application to become a grantee of the FTZ program, serving the Rockford region. In 2007, FTZ #176 was expanded to serve a defined 11-county service area in northern Illinois. Today, companies within 60 miles of GRAA in Stephenson, Winnebago, Boone, McHenry, Ogle, DeKalb, Kane, Lee, Bureau and LaSalle and Putnam Counties can apply through FTZ #176. FTZ #176 is one of Northern Illinois’ most valuable assets for companies that engage in international trade. Businesses now have a tool to improve the efficiency of processes and reduction in costs associated with imports and exports. 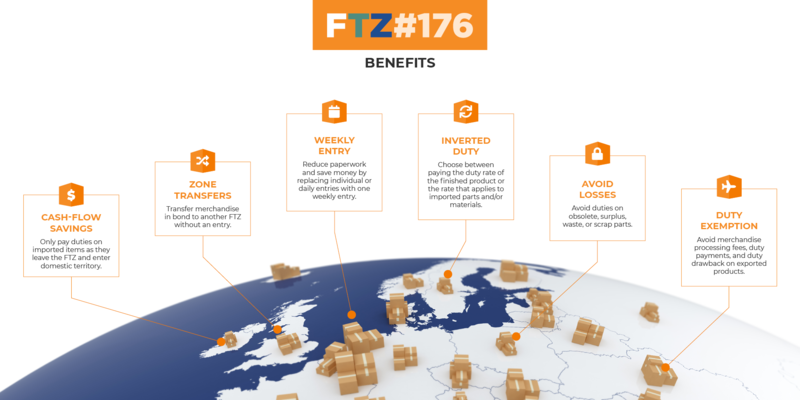 For some companies, the benefits of an FTZ can have a significant impact on operations and the bottom line. As cargo arrived in the country for an FTZ operator, it receives preferential treatment with duties deferred, reduced or eliminated. When product is not held at the port of entry for customs clearance, supply chain management becomes more predictable and streamlined. Accurate reporting improves inventory accuracy, reducing the need for costly emergency shipments. These are just some of the immediate impacts an FTZ can have on private companies. Only pay duties on imported items as they leave the FTZ and enter domestic territory. Transfer merchandise in bond to another FTZ without an entry. Reduce paperwork and save money by replacing individual or daily entries with one weekly entry. Choose between paying the duty rate of the finished product or the rate that applies to imported parts and/or materials. Avoid duties on obsolete, surplus, waste, or scrap parts. Avoid merchandise processing fees, duty payments, and duty drawback on exported products. Want to know if an FTZ can benefit your company? FTZ #176 can conduct a no-cost feasibility analysis for you to estimate the potential value of becoming an FTZ site or subzone. The textile industry is increasingly competitive, and few companies in the industry can maintain their U.S. operations due to costs. Many textile companies have moved operations offshore, taking with them jobs and investment. Fortunately, Andy Honkamp, President & CEO of Cellusuede is always seeking ways to reduce costs and improve his competitive position with his customers.